I seriously don’t know where this month went. It flew by in the blink of an eye, maybe because I was beyond busy trying to juggle different work schedules, balancing my life in between, and overcoming some emotional hardships, which I discussed earlier this week here. It’s definitely been a whirlwind of a month, and I’m not too proud that I didn’t really accomplish much of what I set out for February. The one goal that did stick with me were my daily mediations. Days I didn’t meditate seemed off, and the days I dug deeper within myself, I discovered many things from my past that have been affecting me today. I’ve had some profound meditations this month, so eye-opening that I found myself crying through some, which were the most wonderful and helpful meditations. Now, as far as my other goals, not only was I busier than normal, and I didn’t feel like myself, I also got struck with a cold that basically put me out of commission for the good part of the end of the month. I don’t often get sick, occasionally I’ll get tired or have an off day, but feeling as sick as I do, that hasn’t happened in a very long time. Such is life, one can only stay positive, which I am knowing that Spring, my favorite season, is close! So I didn’t accomplish what I wanted for February, I guess my goal is to make up for it in March and turn it into an amazing thirty-one days. This may have been a low month, but I am hopeful that March will be great, and bring many enlightening and wonderful experiences. Can you tell I’m a proud Patriots fan! 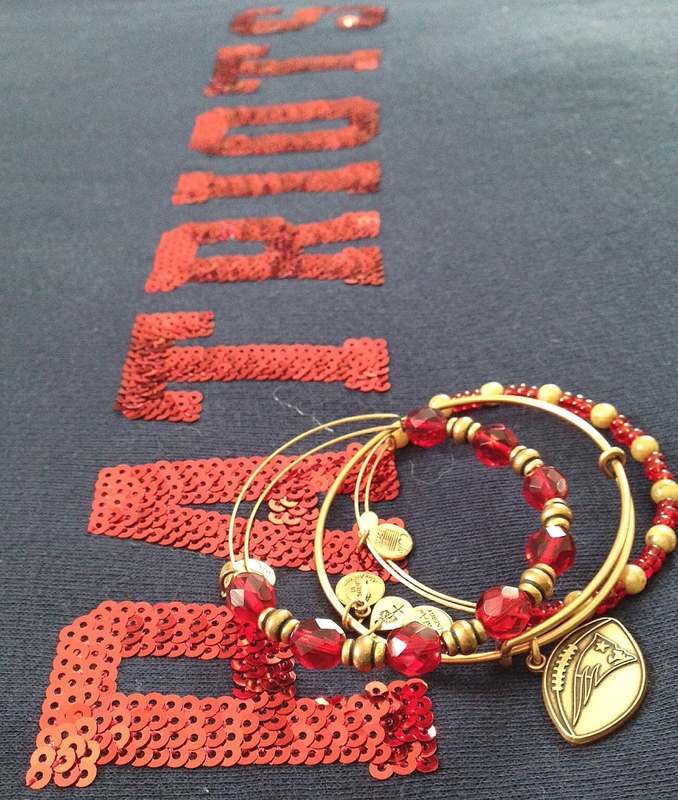 A sequined sweater and Alex and Ani bracelets were my Super Bowl winning good luck charms. Between my different work schedules, and J’s work schedule, which had him traveling during the weekends and working opposite hours than me, it made it even harder to spend time with each other, aside from a perfect Valentine’s day. We spent the snowy afternoon making homemade lobster ravioli, sipping wine while watching movies along the fire, and of course there were chocolate covered strawberries for me. Although, we may not have gotten out of the comfort of staying in, we didn’t have many opportunities to do so, plus I really couldn’t muster myself to brave the cold. So we decided to take a spontaneous weekend trip! It’s just a a quick drive into NYC but we’ll be going to a few restaurants I’ve been dying to eat at for a long time, seeing a comedy show, waking up lazily and just enjoying this anniversary weekend with one another. It’s pretty tough not living together, and not seeing each other as much as we’d like, it’s like having a long-distance relationship sometimes, so this mini-getaway/staycation will be exactly what we need! I did spread love as much as I could, and loved having my gals over for a Valentine’s get-together. Of course I loved being able to be creative and make some pretty things, like these gift boxes, and share some laughs with the girls – I definitely needed it! 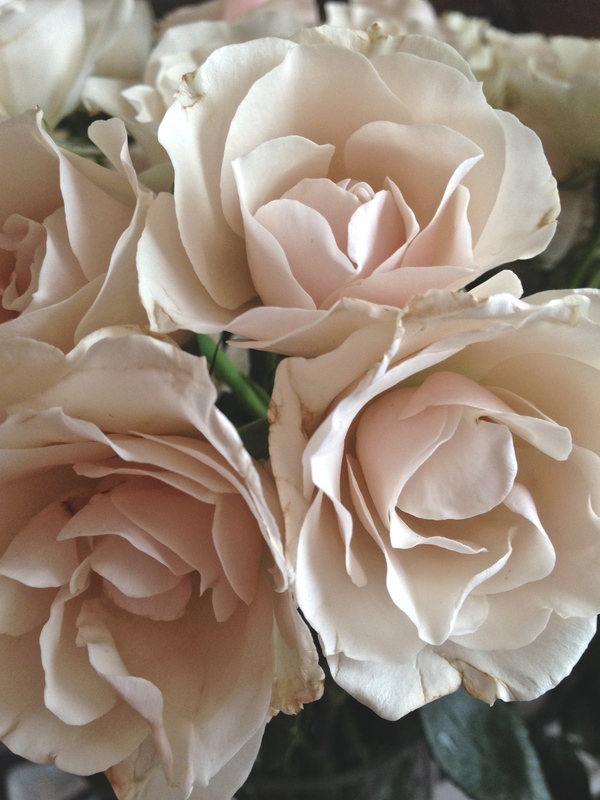 Plus having these florals throughout the house, definitely uplifted my spirits. 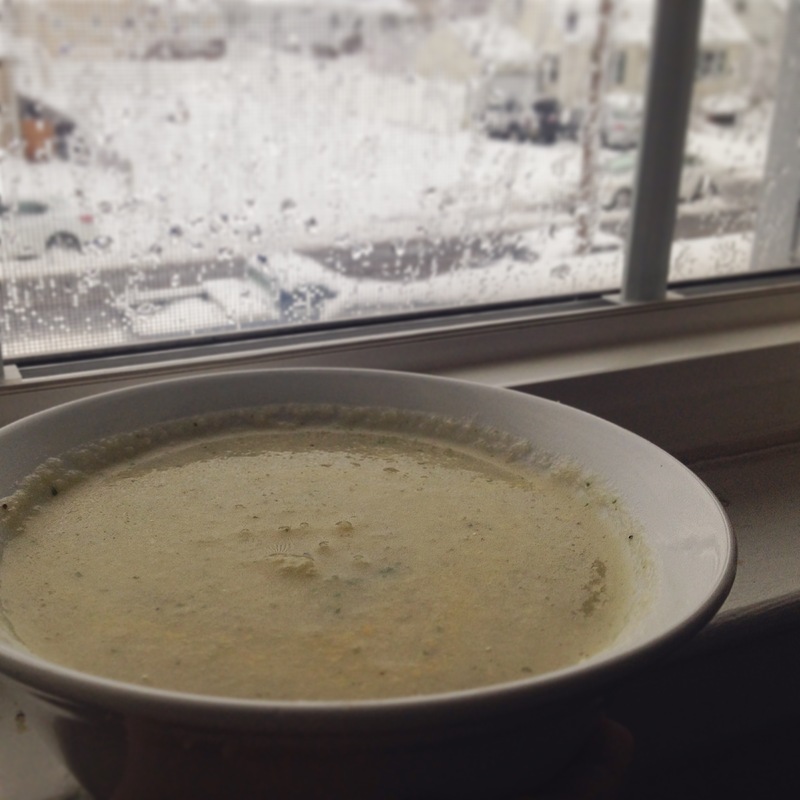 I haven’t had much of an appetite to eat, nor one to cook, but I did make a few things like this two ingredient cauliflower soup from Martha Stewart’s Clean State book, and a beet pear and arugula salad inspired by this beautiful one. This lack of appetite just confirmed I need to embark on the 28 day whole living cleanse again, I feel amazing afterwards, so March seems like the perfect month to take it on! 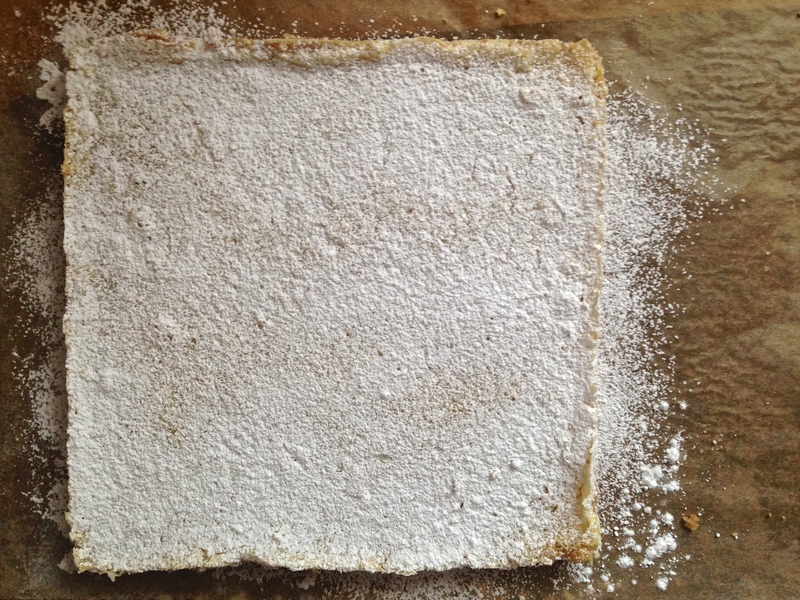 February may have been sour, but these lip-smacking lemon bars were sweet as spring. 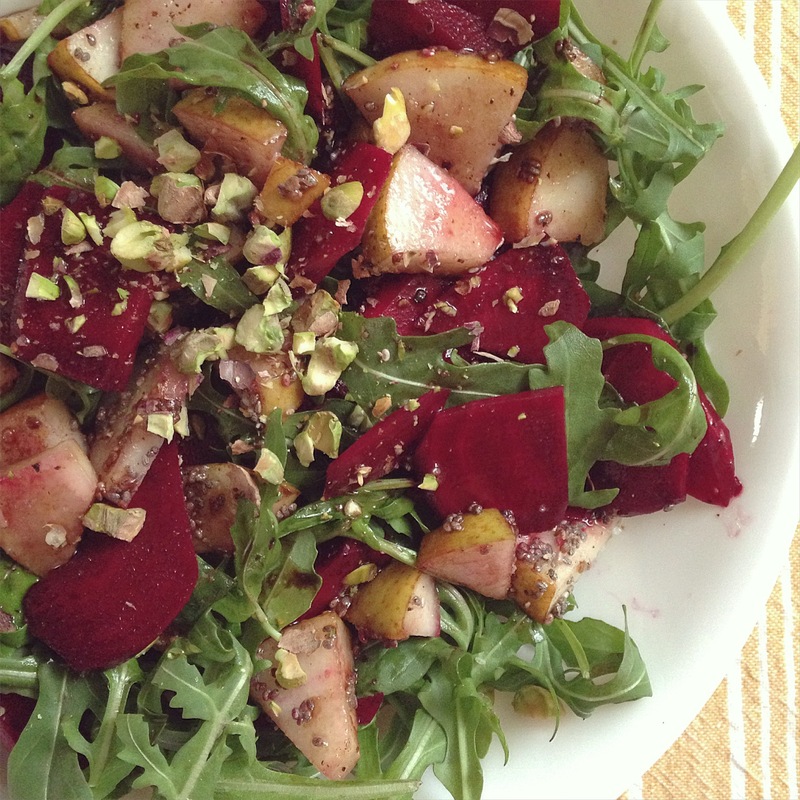 I’ve been working on a few classic recipes for you. 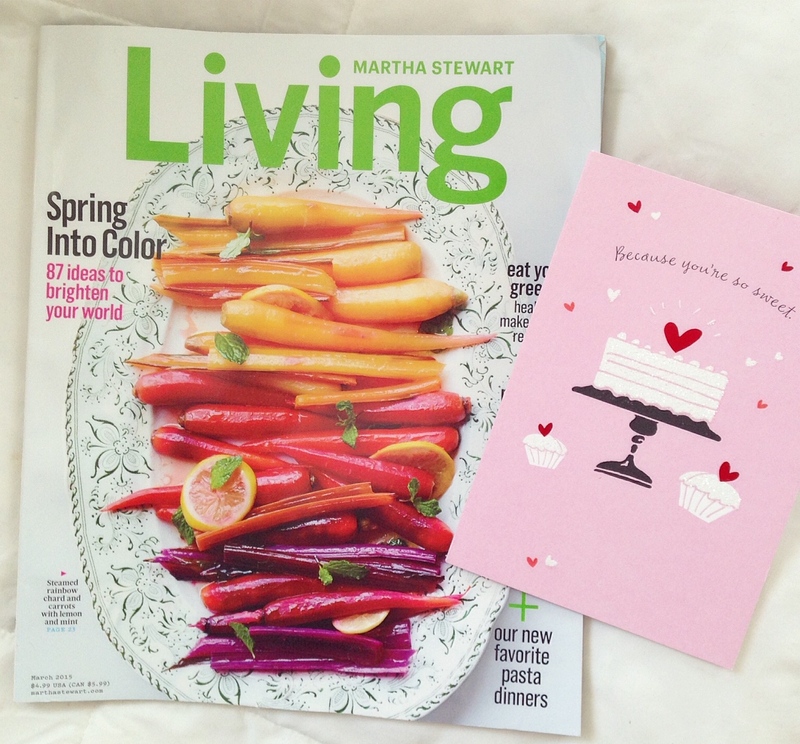 A sweet Valentine’s card from one of my closest friends who just moved to Boston, and the March issue of Martha Stewart Living. These simple things absolutely put a smile on my face. Hope February treated you all well! Happy Friday! Hope all is well now, a lovely post and lovely photos.. Thank you Heather, yes things are definitely looking up! I’d say I’m in a winter rut 😉 Hope all is well, have a great weekend!